Jaws. 1975. Directed by Steven Spielberg. Screenplay by Peter Benchley & Carl Gottlieb. Based on the novel by Peter Benchley. Music by John Williams. Starring Roy Scheider, Robert Shaw, and Richard Dreyfuss. ★★★★★ (Blu ray release) Everyone’s scared of sharks. They aren’t like a slasher, or a Freddy Krueger – you can’t figure out a little trick to outsmart a massive great white shark latching onto you, emerging from up out of the ocean’s depths. Pretend all you want – you’re afraid of a great white shark. They’re fascinating, yet terrifying creatures. Steven Spielberg turns the shark from Jaws into the thing of torturous horror films. 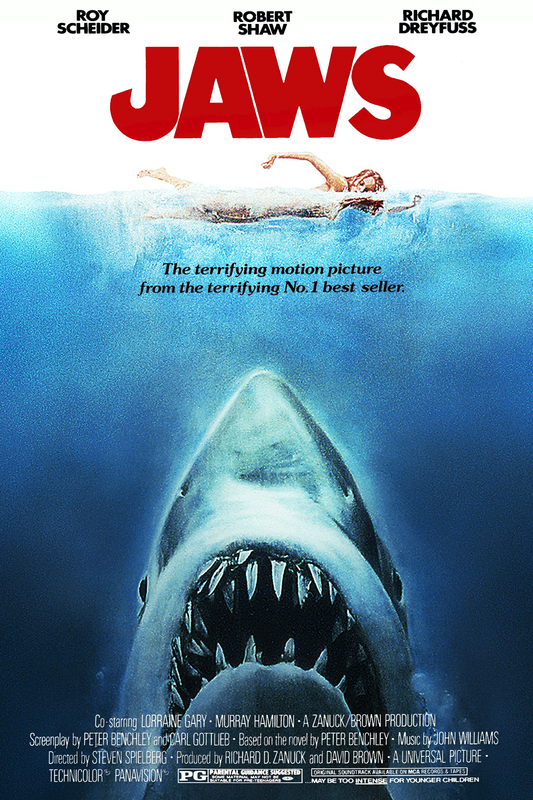 While there have been creature features before and after, Spielberg uses a formula reminiscent of a slasher movie, but instead replaces the killer with a shark. Victims fall one by one until finally the killer is confronted by its opponent, its match – the nemesis. Also, this is very much a horror. As a film, it just wears a disguise. This is one of those movies that doubles as both a dramatic-thriller, as well as a horror. Generations upon generations of people have been scared away from the water by Jaws. I’m a child of the 1980s— being born in ’85, I would’ve probably been about seven or eight by the time I actually saw this [due to my grandfather I saw some really awesome movies before the time a lot of other kids were able to see them. When I did it had a profound effect on me. Forever, I’d be fascinated with horror, in all forms, filmmaking, and eternally afraid of the ocean. Not many films have had such an effect on me. I love many movies, it isn’t often one has such lingering emotions in my mind. While the film Jaws is first and foremost a thriller involving man versus nature, where we watch as the small coastal town of Amity is terrorized by a killer great white shark lurking along its waters, it’s also just as much about character study; focused mainly on chief of police Martin Brody [Roy Scheider]. There’s a certain level of tension Spielerg builds not only through the audience patrolling the beach’s waters with their eyes, but by having us watch Brody, as he seems to be the only one truly worried about a shark in the area. While the community leaders are all concerned more with the business their town does in the summertime, Brody is, of course, worried about the lives of the people frequenting the Amity beach looking for summer fun and instead finding only grisly death in the waters. Some of my favourite moments are in the first 15-minutes of the movie. One in particular is when Spielberg uses a great deep focus shot – a guy is trying to talk with Brody about some kind of municipal issue, and the poor chief is struggling to keep his eyes on the water. While Brody struggles, false alarms go off everywhere because, naturally, the beach would be noisy any time, especially at such an important one. Finally when the shark does come around and wreak havoc, we’re already fairly wound up just by going along for a sweat-inducing thrill ride with Brody. Spielberg does a fantastic job with the tension. This is what the film is all about: tension. With a creeping score from legendary composer John Williams and a point-of-view from that of the shark in the dark waters, Spielberg suggests most of the horror. Though, there are certainly shots of blood and guts in here – no doubt – Spielberg uses tension to really get the terror of Jaws amplified. The opening moments sort of state that as a thesis might, as we watch a poor young girl get thrashed about in the water: we don’t see exactly what’s thrashing her, but watch her reactions, the scared tone of her voice and the look in her eyes. It’s excruciating, especially set in the dark of the evening. From there, we only get brief looks at the shark itself until further on nearer to the finale. This was the smartest move Spielberg made. Very effective, and makes the scares of the movie more about tension than about outright scare tactics. A lot of comparisons to Alfred Hitchcock’s approach in Psycho are well-warranted, in my opinion. It’s easy nowadays for modern audiences to look back and try to pick apart older films in terms of special effects. However, Jaws isn’t a film that gets worse with age— it stands the test of time. The shark, to this day, horrifies me. A shark’s not like a man with a knife, or even a gun, chasing you down some dark alley. Spielberg combines an excellent shark with a lot of quality suspense and tension to really get through to us and crunch our nerves. There’s a reason why a movie like this continually frightens people: because it works. The movie has great performances by Roy Scheider, Robert Shaw, and Richard Dreyfuss in particular. Although everyone does well with their respective parts, Scheider is a favourite of mine. While he did a lot of excellent movies, I believe he’s a highly underrated actor who never truly gets his due. Most times people only remember him from Jaws— his performance here’s great, but I hate when actors with amazing talents are remembered for a single role. Dreyfuss is also pretty awesome, I love him in most anything. The performances work well with everything else going on because it adds a certain credibility to the film instead of it simply being a “summer blockbuster.” Now when we look back on it, even if it was the beginning of the whole blockbuster movie and it’s a genre picture, there is so much more to it including these performances. A 5-star film all around, as well as the Blu ray release which has so many features and excellent little bits it would require a post of its own – I may go that route down the road. I can’t get enough of Jaws. On the one hand, I’ve always been fascinated with the ocean. On the other hand, a film like this is the reason why I’m simultaneously terrified of the ocean, as well. Spielberg played on a very universal fear. Not only that, he took action, suspense, horror, and even a few bits of comedy, and rolled them all into a classic film. Even though I know almost every single move in the entire picture by now, I can’t remember how many times I’ve watched the damn thing, I still find myself creeped out. There are so many suspenseful moments I love, and they do me in with terror. I may not be a fan of everything else Spielberg has gone on to do. I can certainly say, though, Jaws is one of my all-time favourites. This will never change. The day I stop finding this movie scary is the day my pulse slows to a stop. I hope there are lots of others who feel the same as I do because I really believe this is one classic to truly deserve the title.